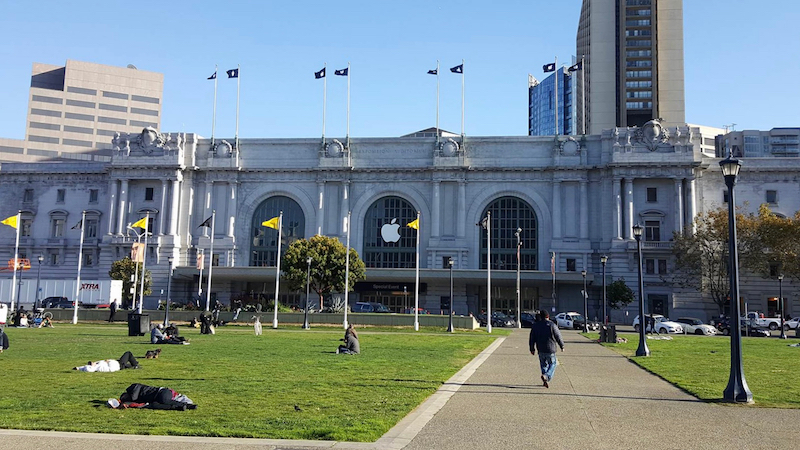 Over the weekend, Apple began decorating the Bill Graham Civic Auditorium in San Francisco, which is where its "See You on the 7th" keynote will be held on Wednesday. Crews have put up window decorations and flags with Apple logos, plus other black-with-colored-dots themed banners and signage. At the event, Apple is expected to announce the iPhone 7 and iPhone 7 Plus, second-generation Apple Watch, and refreshed Beats products. Apple should also provide final release dates for iOS 10, macOS Sierra, tvOS 10, and watchOS 3, and it may have other product and service updates to announce. Apple will provide a live stream of the September 7 keynote on the Apple TV and on iOS and Mac devices through its website. MacRumors will also provide live coverage of the event for those unable to watch, both on MacRumors.com and through our @MacRumorsLive account on Twitter. Do you think they are installing plexiglass barriers between the stage and audience to protect the presenters from flying fruit? Last Apple event before they all take place in the "mothership"? Despite all the negative posts on this site regarding the iPhone 7 this past year I'm actually looking forward to this. Not as excited as in years past but excited nonetheless. Why? Are you expecting to hate what they announce? I don't understand why some people insist on bashing what Apple announces before they even announce it. If you don't like what they announce, then don't buy it. Apple doesn't revolve around you. I'm not saying throw fruits lol, but don't clap for the dumb stuff and just stay quiet when they announce something laughable like another year of 16gb iPhones while charging you 100$ to upgrade it. Have some self respect is all I'm saying. With the first event in the "mothership" most likely announcing the revolutionary new iPhone 8 next year!!! Worst decorations for an Apple event ever. Tim needs to go. Are you being facetious, or are you seriously questioning the CEO's role over marketing for a keynote? What will be served in the menu?